I feel like it's been a long time since I shared a recipe here and for that, I apologize. This is still a food blog and I know I've been sharing a lot of mom and baby content over the past several months... In the past few weeks though, I have felt a shift in our cooking/eating here at home. And while Hannah was a little baby we were basically eating and cooking to survive, recently I've been cooking for the love of cooking a lot more. And I've missed that! So, if you're here for the recipes then rest assured-- I have a lot more coming your way this summer! And a few mom posts too, of course. While I am cooking because I love to cook a bit more again, my cooking strategy has changed a bit. Gone are the days of using every pot and spending over an hour preparing a meal. My recipe M.O. 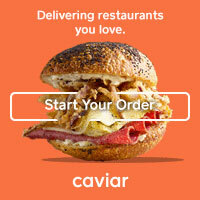 these days is big flavor, relatively healthy, and quick/low maintenance. And this pasta recipe totally fits the bill! For cooking, you'll need a pasta pot and a skillet and that's it for this one-bowl dinner. You can use any short cut pasta that you like and one of the easiest ways to add fresh veggies to it is to toss them into the boiling pasta pot when there are just a few minutes of cook time left. 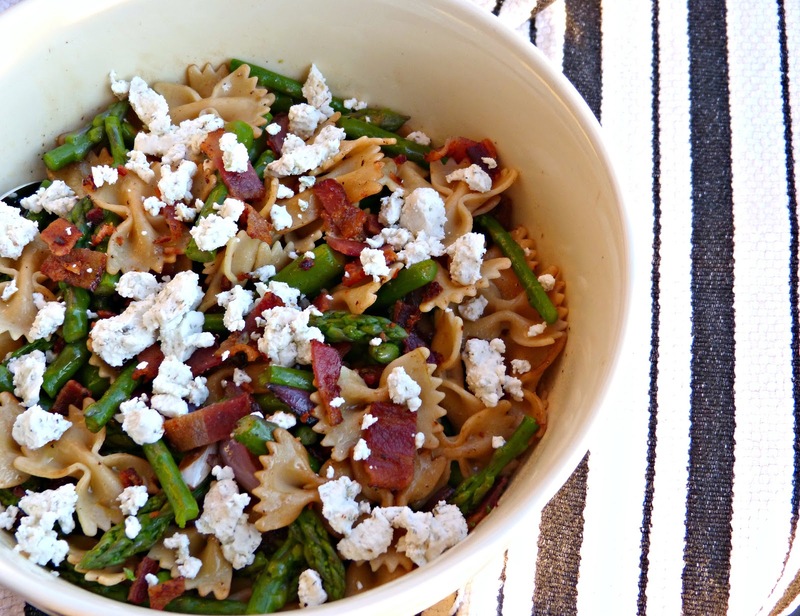 I did that here with asparagus, but it also works really well with broccoli or green beans too. Meanwhile, I cook a little bacon in a skillet, remove it, and cook some red onions in sweet balsamic vinegar and the remaining bacon fat. It's all tossed together with the bacon, asparagus, and the pasta and topped with some herbed goat cheese for a little tangy creaminess. The flavor combination is wonderful and this makes a really satisfying complete dinner in a bowl. Perfect for a summer weeknight! Bring a large pot of water to boil and add pasta. Cook according to package directions, adding the asparagus to the pot when there are 3 minutes of cooking time left. Drain well and set aside. Heat a large skillet over medium high heat. Add bacon to the pan and cook on both sides until crisp. Remove from the skillet and transfer to a paper towel-lined plate. Once cooled, chop bacon into 1/2-inch pieces. Carefully drain the bacon grease from the skillet, leaving 1/2 Tbs. in it. Reduce the heat under the skillet to medium and add the sliced onion to the skillet. Sauté for about 8 minutes, stirring frequently. Increase the heat to medium-high and pour in the balsamic vinegar. Continue cooking for another 3-4 minutes, until most of the liquid has evaporated. 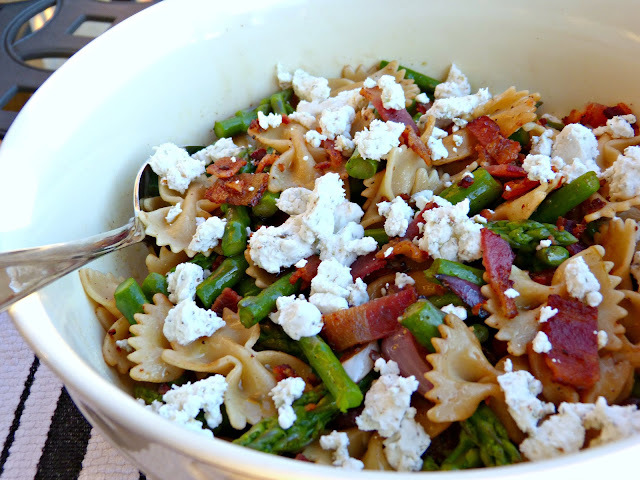 In a large bowl (or in the pasta pot), combine pasta, asparagus, bacon, onions and any liquid from the skillet. Drizzle with olive oil, season with pepper, and toss to coat. Sprinkle the crumbled goat cheese over the top and serve. i am so happy to see that you are enjoying your motherhood. it can be a little challenging but i am sure you wont even trade a world for them.